A slightly edited version of this article was originally published in the February, 1992 issue of Monitoring Times magazine. Suddenly, it was gone. For seven years, Radio Impacto had been one of strongest Latin American shortwave stations - and one of the most controverial. But, in one feel swoop, it was gone. "Mission accomplished?" some asked. Perhaps so. Let's take a close look at the station and its sudden end. The events all still seem so recent. It was only in July, 1979 that the Sandinista guerillas, aided by massive strikes and a general uprising of the Nicaraguan people, overthrew the Somoza family dictatorship in Nicaragua. The dictatorship had been one of Latin America's most ruthless, and its lenghtiest. Starting in 1932, the country was ruled first by father Anastasio Sr., then after his 1956 assassination by eldest son Luis, who died of cancer a few years later and finally by youngest son Anastasio Jr. Family friends occasionally held the presidency, but there was never any doubt where the real power lay. When such an entrenched regime falls, it doesn't just disintegrate. Thousands of members of Somoza's national guard and many Somoza family associates fled north across the border to Honduras. With help from the US, they would become the nucleus of the FDN, Nicaraguan Democratic Front, the primary contra group. Later, as the Sandinista government moved increasing leftward, many Sandinistas became disenchanted with Daniel Ortega's government. They moved southward to Costa Rica, where former Sandinista Eden "Commandante Zero" Pastora formed ARDE, the Democratic Revolutionary Alliance. At first, Costa Rica was very supportive of the Sandinistas. The government of President Rodrigo Carazo (1978-82) openly supported the Sandinistas in their overthrow of Somoza. Later, Carazo strongly resisted efforts of the US government to turn Costa Rica into a Contra base. However, Luis Alberto Monge, elected in 1982, was much more compliant to the needs of the contras - at least the ARDE band who weren't tainted by connection to the former Somoza dictatorship. Radio, of course, is important in any revolutionary effort, and the contras had their share of stations. The FDN's Radio Quince de Septiembre began broadcasting not long after their move to Honduras. Eventually ARDE followed suit with La Voz de Sandino - claiming to be the true spirit of Sandinismo. Other clandestine stations such as Radio Nicaragua Libre and Radio Miskut aimed for different slices of the counter-revolutionary audience pie. Meanwhile the Sandinista government fought back on the airwaves with Radio Sandino and La Voz de Nicaragua, and a chain of AM stations such as Radio Frente Sur and Radio Poder Popular. It was into this chaotic, highly politicized radio scene that Radio Impacto stepped in 1983. It's unlikely we will ever know who originally decided to put Radio Impacto on the air. It is known, however, that Manuel Jiron Castrillo was the man given the job of doing it. A former broadcaster at Managua stations Radio Mi Preferida and Radio Amor, Jiron had close Contra connections. Officially, the owners of Radio Impacto were a group of Venezuelan businessmen in the firm "Inversiones Feranto, S.A.". Little is known of this company, other than that it helped channel U.S. government funding and supplies to the contras. The frequencies were now in hand, but ABC radio's transmitters were too puny for what Radio Impacto needed. Twenty-kilowatt AM and SW transmitters were installed at the antenna site in Alajuelita, southwest of San Jose. Radio Impacto, following the example of San Jose's principal AM stations, operated AM repeaters elsewhere in the country. There was an interesting difference, however. The other stations had high power transmitters in San Jose and low power one kilowatt repeaters in other principal Costa Rican towns. Radio Impacto installed a huge 50 kilowatt repeater in remote northwestern Guanacaste province, near the Nicaraguan border. No one had ever heard of installing such a huge repeater, two and a half times more powerful than the main station! AM transmissions began on April 11, 1983, with an ad in the local newspapers, and shortwave followed several weeks later. At this time, Impacto was a nondescript Latin station playing mainly Spanish pop music. The first reported loggings of the new station were made on May 28 by Ernie Behr of Ontario and Fritz Melberg of Iowa. Both noted strong reception and that the station was asking for reception reports. A few days later, on June 3, Robert Mills of California logged it and noticed there were no ads, which was rather strange for what was assumedly a commercial station. Gradually, Radio Impacto's programming began to evolve. In August, 1983, the station started its first Impacto Noticioso newscast, every half hour. Radio Impacto's extensive news broadcasts came from a variey of sources. The more convential ones were via UPI and Agencias Latinoamericanos Noticias teletype. In addition, the station maintained a regular telephone contact with the FDN in Tegucigalpa. Official government press releases from Honduras and El Salvador were relied on for news from those countries. For news of the war in El Salvador, Radio Impacto reported directly from official Salvadoran Defense Ministry Reports, hardly an unbiased source. Programming began to emphasize events in Nicaragua from an anti- Sandinista viewpoint more and more. In a program called "Love Letter to Nicaragua", former Somocistas and renegade Sandinistas criticized the Sandino government and boasted of the day they would take over. 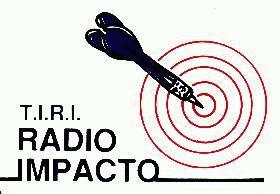 Radio Impacto began occasional relays of both Radio 15 de Septiembre and La Voz de Sandino. All of this seemed quite out-of-character for a station purported to be a local Costa Rican broadcaster. At one point, Radio Impacto even carried regular newscasts in the Miskitu Indian language, spoken on Nicaragua's Atlantic coast, although there are no Miskitus in Costa Rica. Thus, it wasn't long before DXers, and Central American news analysts, began to suspect that there was more than a casual relationship between the Radio Impacto and the Contra rebels. Radio Impacto wasn't, however, without its humorous moments. In December, 1983 it had to stop its all-night broadcasts because of problems with the announcers drinking on duty! Unusual goings-on surrounded Radio Impacto from the beginning. By the end of 1983, station director Manuel Jiron had been fired by the powers behind the station. Rather than leaving quietly, Jiron wrote a book, Exilio, S.A., in which he denounced the station he set up. He then sued the station for good measure, although he lost the court case. Radio Impacto did little to hide its Contra connection. On its staff were an official spokesperson for the FDN, some announcers from former Somoza radio stations in Managua, and several former staffers for La Prensa, the the primary anti-Sandinista newspaper in Nicaragua. Elsewhere, Impacto's Tegucigalpa correspondent actually doubled as the FDN's local spokesman. The strongest evidence for the contra connection came from Edgar Chamorro, former director of communications for the FDN, who told the World Court that Impacto was a CIA operation. Despite this, in 1987 Alfredo Cesar, then head of the Contras in Costa Rica, denied to Radio Sweden DX editor George Wood that there was any contra connection to Impacto. The Sandinistas, as would be expected, reacted to Radio Impacto. For a while Radio Impacto and Radio Sandino played a game of frequency cat-and-mouse in the 49 MB as Radio Sandino plopped down right next to Impacto's frequency, and then Impacto hopped around trying to find another clear channel. Eventually Radio Sandino moved up to 6200 and Impacto settled on 6150, with the eventual addition of 5030/5044. "In 1985, the powerful signal from Radio Impacto was one of the most clearly heard throughout Nicaragua" (Soley & Nichols, p246). A few years later, Radio Sweden's George Wood wrote that "The biggest media threat to Nicaragua comes from Radio Impacto." Adrian Roque, head of the news department at La Voz de Nicaragua agreed with him, stating that Radio Impacto "... (is) our most important competition . . . we're forced to be better, especially in our news coverage." As a established legal member of the media, Radio Impacto was allowed by the Sandinista government to keep a correspondent inside Nicaragua. The Sandinista government, however, expected him to restrain himself to the normal duties of a correspondent. This became especially clear when he was arrested for destablizing the country by, among other things, recruiting for the ARDE guerillas! Eventually Radio Impacto found permanent reporters by recruiting two opposition FDN-associated deputies in the Nicaraguan General Assembly. Under Nicaraguan law, their actions were protected by parlimentary immunity. While Radio Impacto was loud and boisterous on the air, locally it tried to remain secluded in suburban San Pedro de Montes, outside San Jose. No sign was ever put up to advertise the station's presence, and visitors were not given friendly treatment, quite unusual for a Latin American station. Japanese DXer Takayuki Inoue visited Radio Impacto in 1985 and noted "The station building is in an ordinary house, and it is hard to imagine a radio station from the outside . . . I was quite embarrassed by the cold attitude to me," (Inoue, 1987). Austrian Christian Zettl stopped by not long afterwards and wrote "It appears the station is not very interested in visitors - I had to try two times until they finally let me in, only after declaring precisely the purpose of my visit and after handing over a personal identification. The person in charge of receiving visitors turned out not to be very willing to provide any in- depth information" (RIB 104). Later, when Radio Sweden DX editor George Wood tried to visit the station, he wasn't even allowed inside. Each of the three visitors had comments on Radio Impacto's programming. Inoue noted that there was much greater emphasis on reaching a Nicaraguan audience than a domestic, Costa Rican, one, and concluded "Though they pretend to be a usual commercial radio station, I would rather call them a 'semi-clandestine' station," (Inoue, 1987). Zettl reported that the Costa Rican media was anti-Sandinista in general, but that Impacto was the most outspoken, and the Nicaraguan focus was obvious from their newscasts. In fact, Costa Rican journalists told him that "Radio Impacto is controlled by anti-Sandinistas with close ties to the FDN and that its SW is aimed at Nicaragua". Even the Costa Rican government was in the dark when it came to Radio Impacto. On November 24, 1988, Costa Rican Public Security Minister Hernan Garron Salazar, talking to reporters, called Impacto a Contra station and admitted that his department had no idea of who really owned the station. However, he noted, it was a legally licensed station under Costa Rica laws, and as a democratic government Costa Rica had no right to censor or interfere with it in any way. As the 1980s progressed, the contras didn't succeed on the battlefront, but continued to be a formidable military force in the region. The biggest threat to the contras came not from Nicaragua, but from Washington D.C. When the Iran-Contra scandal surfaced, the U.S. Congress became far less compliant to the Reagen administration's requests for funding the contras. But, with the help of a little belt-tightening, and some say drug- smuggling on the side, the Contras survived. According to sources in Costa Rica, Contra belt-tightening included a decrease in funding for Radio Impacto. Without a new source of income, Radio Impacto's continued existence was in jeopardy. Radio Impacto was in luck, as it was just then that the Manuel Noriega affair reared its head in Panama. The U.S. was now out to get Noriega, and radio propaganda would again be an important part of the campaign. Radio Impacto was in the perfect position to become the primary anti-Noriega station. A new fifty kilowatt repeater was installed near Cahuita, on Costa Rica's Caribbean coast, south of Limon. Huge directional antennas towards Panama took advantage of the all-water path to make Radio Impacto one of the best heard stations throughout Panama. By the time Manuel Noriega held elections in Panama, in Spring, 1989, Radio Impacto had become the most listened to station in Panama. The Sandinistas had clearly taken a back seat to Manuel Noriega in Radio Impacto's war of words. Noreiga's election was, of course, a fraud, but oddly Radio Impacto denounced the election as being fraudulent before the foreign observers in Panama did! Ten months later Radio Impacto kept watch as U.S. forces invaded Panama. While reports that Radio Impacto transmitted coded messages to U.S. forces may have been the result of overactive imaginations, cleary Radio Impacto was "the station of the invasion", as some maintain. No other broadcaster followed the fall of Manuel Noriega so closely. Noriega was gone, but it was time for Radio Impacto to turn its attention back to Nicaragua because President Daniel Ortega was up for reelection on Febrary 25, 1990. After ruling the country under a revolutionary junta for five years, Ortega had been elected president in 1984 in elections that were certified as free and fair by numerous neutral international observers, but were ignored by the Contras. In the 1990 elections, the Contras and other Sandinista opponents united under the Union Nacional Opisitora (UNO) party. At its head was Violeta Chammorro, widow of Pedro Chammorro, a popular Nicaraguan journalist who was assassinated in 1978 by henchmen of the former Somoza dictatorship. Although Chammorro was well known, most observers and all the polls indicated that Ortega would win by a wide margin. UNO, however, had a very deep campaign chest (so deep that it seemed unlikely the money only came from Nicaraguan sources) and lavishly spent on promoting Chammorro's candidacy. Radio Impacto did its part by airing numerous commercials for UNO, in direct violation of international agreements prohibiting interferance in the elections of other nations. Almost everyone, including Radio Impacto, probably was surprised at Chammorro's victory. While Impacto may have been surprised, it was also jubiliant. Still, Radio Impacto closely followed the Nicaraguan scene until Chammorro was officially sworn in as Nicaragua's president on April 25, 1990. Now, suddenly, Radio Impacto no longer had a purpose. Like everything else about Radio Impacto, its end was shrouded in secrecy. By chance, it was then that my wife and I made a long- anticipated trip to Costa Rica, which would of course include numerous station visits. A few days after arriving, I visited Radio Reloj (700/4832/6006) for a long visit with station manager Roger Barahona, a long time veteran of Costa Rican broadcasting. When I asked Senor Barahona what he thought of Radio Impacto, he expressed the usual answer I got from Costa Ricans - that it was a political station, somewhat of an embarrassment, and probably financed by the CIA. I had, of course, heard that it was for sale, hadn't I? My mouth dropped open. Yes, he continued, the timing was very interesting - just days after Chammorro's inauguration in Managua. With the Sandinistas out, what was left for Radio Impacto to do? Senor Barahona wasn't very optimistic for the future of the station. He couldn't imagine anyone wanting to buy it - it was "a white elephant." No one in Costa Rica needed those 50 kilowatt repeaters in Guanacaste and Cahuita, nor the 20 kilowatt shortwave transmitters. Even the main 20 kilowatt AM transmitter in San Jose was more powerful than needed to reach the San Jose metro area. The electric bills would break anyone without deep pockets. Only the AM frequency of 980 kHz had some value, but not with those power-gobbling transmitters. A few days later, Senor Lafuente of Radio Rumbo (530/6075) agreed with Senor Barahona, adding that Impacto was, in fact, "a BIG white elephant." So, a few days later Theresa and I took a local bus to suburban San Pedro de Montes. San Jose does not use street numbers; instead addresses are given in terms of how many meters they are from an important landmark. In typical San Jose fashion, the telephone book gave an address of "25 meters southeast of the Higueron". With the help of passersby, we located the Higueron, which turned out to be a large tree on an island in the middle of the street! We looked around, but there was no sign. Nor did any of the houses have guards, as others had reported. The presence of a radio station was only marked by a fifty foot antenna in the middle of the block - obviously a studio transmitter link. But, it was impossible to tell exactly which house it belonged to. We began asking passersby and nearby shopkeepers where the station was. It took eight tries to find someone who knew - Radio Impacto had kept itself well hidden, even from the neighbors! Unlike other DXers in the past, we had no problem getting inside Radio Impacto. The gate was unlocked, so I went up and knocked on the door. A few moments later, the door was opened and a friendly face appeared. I explained who we were, and we were invited right in. Our host, Juan Carlos Aguero, knew all about DXing. He had been a DXer himself for ten years and a ham operator for five. He had worked at Radio Impacto since its beginning and was now helping close it down. Radio Impacto was like a skeleton. Once bustling rooms were now deserted. The recording studio in the back of the house was now dusty and unused. Desks were empty and cleaned out. Cardboard boxes were piled on tables. Cassettes, papers, and odd electronic parts were scattered everywhere. In the newsroom, the teletype machines were turned off. A Kenwood R-600 receiver that had been used to check the latest news from the major shortwave broadcasters was now gathering dust. Still, signs of Impacto's past abounded, such as the bumper stickers on the walls. One proclaimed "In Costa Rica for the democratization of Panama", while another with a Panamanian flag said, "With the OAS or without the OAS, we shall continue the fight." The only thing that remained the same was the studio. The cassette decks, cartridge machines, and turntables were still there, and records and tapes lined the tables. Posters of pop groups covered the walls and "Radio Impacto" was spelled out on them in huge red letters. Perhaps because of the experience of years of secrecy, Juan Carlos avoided giving much detail about the station's operations. However, he seemed happy at the lack of security at the station, which he pointed out was no longer necessary since they were up for sale. The closest he came to giving some background about the station was when I asked why Radio Impacto didn't have a sign. "We're in an unmarked house because we're a political station . . . no, because we want democracy like Costa Rica has for those who don't have it." As Juan Carlos explained, everyone at Radio Impacto had been ecstatic after Violeta Chammorro's victory and then inauguration as president of Nicaragua. But, it was just days after the inauguration that the staff was called in to a meeting and told that the station was being sold and would be closed down in early June. Layoffs among the 20 person staff began immediately. A month later, at the end of May, only five were left; an administrator, an accounting clerk, and three announcers, including Juan Carlos. Juan Carlos explained that this made his job "polyfunctional": between the usual DJ duties of spinning disks, he had to answer the phone (which now rang in the studio), answer the door, show visitors around, and in general keep an eye on things. He lamented about how in the old days announcers were pampered so they could could concentrate on their jobs. "Before someone would bring you coffee if you wanted it, but now you must make it yourself." Obviously Juan Carlos' duty as an announcer now was simply to fill up air space. During the hour we were there, he played entire LP sides, inserting taped ID announcements and maybe a live time announcement after each side. A little dead air wasn't important; nor was it important when the telephone rang beside the microphone. His duties did not extend to security, which had fallen by the wayside. A few years before, a Costa Rican reporter had been interrogated by Impacto's security staff for taking a picture of the front of the building. Yet while Juan Carlos was on the phone, we were free to roam the rooms to take pictures. I asked Juan Carlos how much time he had left at the station. He would be there until the end, which was scheduled to be June 10. After that, I asked? He wasn't worried about finding a new job. He pointed out that he had lots of experience and plenty of contacts in the San Jose radio scene. I wished him luck. Radio Impacto didn't close down on June 10, as expected. Canadian DX Richard McVicar, who was studying Spanish in Costa Rica in preparation for working at HCJB, stopped by on June 21 and had a long visit with Juan Carlos. By that time, Juan Carlos was the only staff member left. Programming was simply cassette tapes of music with occasional IDs. Sometime after that, Radio Impacto finally did go off the air forever. At the end of July, a buyer was found - for the AM frequency and the 20 kilowatt AM transmitter. Parmenio Medina, a long time staff member at San Jose's Radio Sonora had put together the money. Reportedly he paid six or seven millon colones, with 500,000 colones down. In dollars, that was about sixty to seventy thousand dollars, wth five thousand dollars down! The new station would be called Radio Cordillera and was to have begun transmitting on September 1, 1990. The shortwave transmitters took a little longer to sell, but were not quite the "white elephant" some imagined them to be. Small scale international broadcasting is an up-and-coming industry in Costa Rica. There were reports that Radio For Peace International bid on the SW equipment, but apparently, their bid was not enough, or the conservative owners were uncomfortable with RFPI's politics. Instead, the shortwave equipment and the 50 Kw medium wave transmitters were purchased by Adventist World Radio's Costa Rican station. AWR has moved all their new and old transmitting equipment to the old Impacto medium wave site at Cahuita. By the rule that transmitter sites are stations, this creates a new shortwave station, even for those who have already verified the original AWR site at Alajuela and Radio Impacto. That's the story of Radio Impacto. It's gone, and we won't hear anymore about it. At least not until someday in the remote future when secret U.S. government documents about the contra war are declassified . . . or a CIA agent involved in Central America tells all in a kiss-and-tell book. It may never happen, but if it does, it will be interesting. There are surely many more secrets to be told about Radio Impacto! Check the Costa Rica Radio Gaphics & Photos menu for some photos and other graphics of Radio Impacto. Bermudez, Manuel. En la Guerra de las Ondas, Costa Rica no fue Neutral. Semanario Universidad, May 11, 1990. Frederick, Howard H., Ph.D. The Radio War Against Nicaragua. Reveiw of International Broadcasting #107. FRENDX, monthly journal of the North American Shortwave Association. February, 1984; January, 1989; July, 1989. Inoue, Takayuki, et. al., eds. LA-DXing, 4th edition. Radio Nuevo Mundo, Tokyo, 1987. La Guerra de 'Impacto' Crece Bajo la Paz de Costa Rica. Semanario Universidad, August 18, 1989. McVicar, Richard. A Visit to Radio Impacto. DX Ontario August, 1990.
Review of International Broadcasting. Issues #78, 85, 90, 95, 104, 106. Soley, Lawrence, & John Nichols. Clandestine Radio Broadcasting. Praeger, 1987. Wood, George & Hermud Pedersen. The Radio War in Nicaragua. Monitoring Times September, 1988. This article is copyright 1992 by Don Moore. It may not be printed in any publication without written permission. Permission is granted for all interested readers to share and pass on the ASCII text file of this article or to print it out for personal use. In such case, your comments on the article would be appreciated.